With their sleek appearance and high-quality materials, the matching Bazza Stacking Benches in this set offer the best in modern style and performance. The bench-style loveseats feature stackable aluminum frames, plus arms and slotted seats/backs crafted from Marine Grade Polymer (MGP), a cutting-edge substance made to withstand harsh weather conditions. 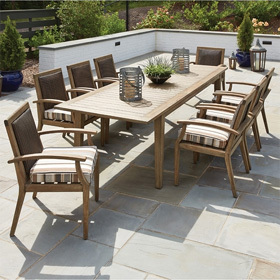 This bench set is ideal for casual-look porches and patios. Will not crack, rot or separate in any outdoor climate - even at the beach house! Made with over 30% FDA Approved Recycled Resins. Environmentally Preferable Product - LEED for Homes (U.S. Green Building Council): 0.5 point / MR credit 2.2. Benches 60"W x 25"D x 35.5"H 62 lbs.